With its sleek housing of brushed metal, the Breville BTA840XL (Est. $175) looks great in contemporary kitchens, and it's a real treat for tech lovers. There's no manual lever on this toaster -- instead, it has an internal smart chip that automatically lowers and lifts bread. It also comes in a two-slice version, the Breville BTA820XL (Est. $120). The Breville BTA840XL is the top pick in the four-slice toaster category at Consumer Reports, earning an Excellent rating for ease of use; Very Good ratings for color range, batch consistency, one slice performance and ease of cleaning. At Wirecutter, where it's the upgrade pick among four-slice toasters, testers say that it "consistently turns out perfectly browned toast." They also praise it's plethora of features and other nice touches that add to its convenience. CNET put the BTA840 XL through its paces a couple of years ago, and was impressed with how distinct each of the seven doneness settings were, all of which gave "predictable and satisfying results." The Breville comes with a unique "Lift and Look" feature that allows you to take a look at your toast without interrupting the toasting cycle, and it also has the "bit more" button if you decide you want just a touch more browning. Its LED panel illuminates to show toasting progress according to the setting you've selected on the variable browning control. Rather than a single control for all four slices, the Breville has independent controls with five browning settings for each pair of slots so you can, for example, make toast one side, toast or waffles in the other. It also has bagel and defrost settings. Owners also give the Breville BTA840XL high ratings compared to other toasters in its price class, praising its consistency and stylish looks. The stainless steel looks upscale, while the push-button controls give it a modern vibe. It's also very sturdy and durable. It's heavy, though, at 9.5 pounds, so you may want to find another option if you want something you can easily move. It has an easy-to-remove crumb tray and a cord wrap, and it's backed by a one-year warranty. 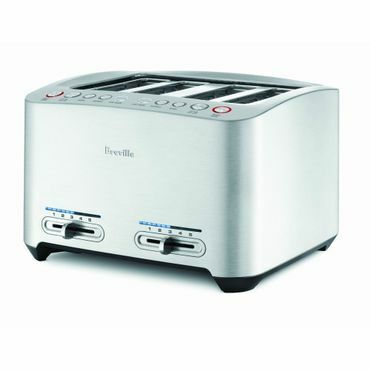 The Breville BTA840XL is a traditional four-slot toaster. The very similar Breville BTA830XL (Est. $140) instead has two long toasting slots. The only other difference is that the BTA830XL is slightly less powerful at 1,600 watts to the BTA840XL's 1,800 watts The BTA830XL was a very close runner up to the BTA840XL, with nearly as many expert nods and equally good customer reviews, so we suggest that, all other features being equal, you get the one that best fits your space. If you like the idea of the Breville's features but can't stomach the price tag, the Cuisinart CPT-440 Touch to Toast (Est. $110) hits more of a budgetary sweet spot and still provides some nice extras. Like the Breville, it has a sleek stainless steel finish and is available as a two-slice model, the Cuisinart CPT-420 (Est. $60), discussed in our section on two-slice toasters. Testers with Your Best Digs praise the Cuisinart for its "incredibly consistent" toasting and say the slots are wide enough to easily accommodate bagels and thick breads. Features include a motorized lift, a backlit LED display, and dedicated settings for toasting bagels, defrosting and reheating. There are seven browning settings and, like the Breville, each pair of slots can be operated independently. Some reviewers do say the toaster is on the slow side, though. At 6.5 pounds, the Cuisinart isn't as heavy as the Breville and it has a cord wrap to keep counters and cabinets uncluttered. There is a removable crumb tray and it's backed by a three-year warranty. If all you need is a basic four-slice toaster, thousands of owners say the Hamilton Beach 4 Slice Cool Touch Toaster (Est. $30) is a great choice that's easy on the wallet. It's also available as a two-slice model, the Hamilton Beach 2 Slice Cool Touch Toaster (Est. $25). The Cool Touch has dual controls that allow users to operate each pair of slots independently. It has dedicated settings for bagels, frozen bagels and frozen toast. The 1.5-inch slots are plenty wide for big bagels or all but the thickest slices of bread, and the toaster gets kudos for even browning. The automatic toast boost makes it easier to get bread out of the slots, a popular feature among reviewers, and there are removable crumb trays for cleanup. There are scattered reports of durability issues such as busted heating elements. Users also warn that this toaster may get quite hot on top, though most say the sides are still cool enough. It's backed by a one-year warranty. One other choice in this budget category that gets a nod from Wirecutter, but pretty "meh" reviews from owners, is the Oster TSSTTRWF4S 4-Slice Toaster (Est. $35). It's actually pretty well-featured for such a cheap toaster, with bagel and frozen modes, seven darkness settings, and, best of all, a retractable cord. The bread guides adjust to the bread size which, theoretically, helps it toast more evenly. And that seems to work. In testing at Wirecutter, it toasted bread very evenly even after multiple batches. It also did well with other breads: bagels, English muffins and frozen waffles. However, you might have to fiddle with it a bit more than some pricier toasters to get the best results. Alas, it's that wonderful retractable cord idea where things seem to fall apart for users. Most of the negative reviews we spotted centered around the cord shorting out or no longer retracting after a fairly short time. We also saw a number of complaints that it was difficult to get the knobs to stay down and you sometimes had to press it several times. Performance-wise, though, most seem pleased, so this would likely be a good choice if toast is more of a treat than an everyday event. This Oster toaster comes in both red and stainless. If you need a toaster that can do some morning multi-tasking, the West Bend TEM4500W Egg and Muffin Toaster (Est. $70) is more than worth a look. It can toast four slices of bread, cook eggs and even warm pre-cooked meat. Available in black or stainless steel, it also comes as a two-slice version with a smaller egg cooker, the West Bend TEM500W (Est. $45). In addition to toasting, the West Bend can poach or scramble two eggs, or hard/soft boil eight eggs at a time. It has bagel, defrost, egg and egg/toast settings. Wide slots allow users to toast bagels or thicker breads. When cooking toast and eggs, it keeps the toast warm until the eggs are done. The West Bend also has a high-carriage bread lifter, which makes it easy to remove smaller breads, and dual controls to operate each pair of slots independently. If space is at a premium in your kitchen, note that owners warn that the West Bend takes up a lot of real estate on the counter. It also gets mixed reviews for ease of cleaning, though there is a slide-out crumb tray. The cord also wraps underneath the toaster for storage. It's backed by a one-year warranty. If you already have a toaster or want a breakfast sandwich maker that's a little more compact, the Hamilton Beach 25477 Breakfast Electric Sandwich Maker (Est. $20) has legions of fans for its ability to quickly turn out a complete, tasty breakfast. Available in black, silver and red, the sandwich maker is easy to use and clean, reviewers say. Though it's not large enough to warm regular bread, the Hamilton Beach is ideal for sandwiches made with English muffins, croissants, biscuits and bagels; some owners also report using small pancakes or trimming down waffles to hold fillings including pre-cooked meat, vegetables and cheese. The sandwich maker also includes a cooking plate for a single egg. A green light tells users when the appliance is hot enough – after that, it takes only five minutes to cook a breakfast sandwich. All of the Hamilton Beach's removable parts are dishwasher-safe for easy cleanup, but many reviewers say it's simple enough to rinse the nonstick surfaces, which do a good job of keeping egg or cheese from crusting on. At about 7 by 7 by 9 inches, the sandwich maker is also more compact than a typical toaster, so it's easy to store in a cabinet. Some reviewers grouse about the lack of an on-off switch -- you have to unplug it -- and a few others say the nonstick surface is prone to scratching and flaking. The warranty is one year.